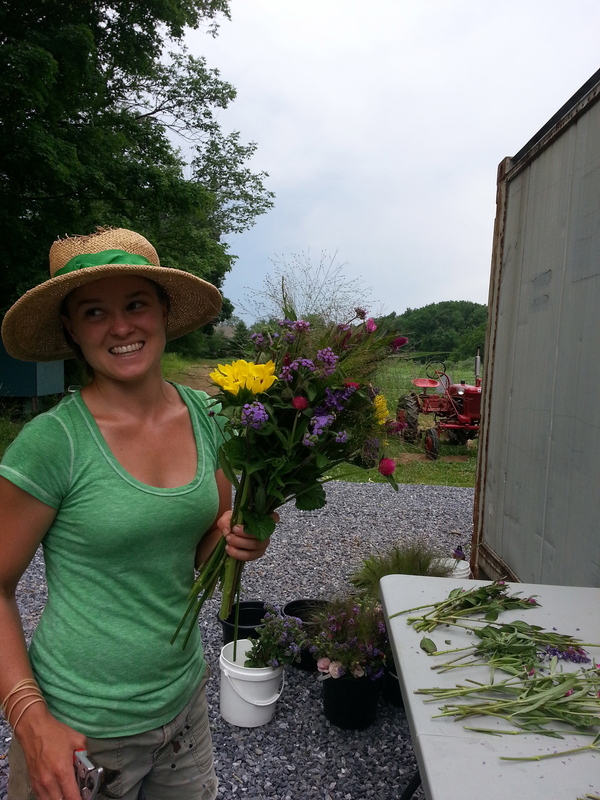 Natalie works with the bees to grow and bunch the most amazing bouquets for markets, wholesale and select events. Natalie comes from Princeton, New Jersey with a background in dairy farming. Because the flowers are beautiful and they don't need milking twice a day she is happiest among them picking each stem by hand. Natalie and her husband Josh own the land of Roots to River Farm in Solebury. They aim to be good stewards of the property and have grand plans for vision of the farm. This is Kat's 6th season at R2R! She fits right in here because she has love for the outdoors, fruits, veggies, wellness, and fitness. Kat has an affinity for discovering what comprises a healthy life. Before finding R2R Kat worked as a preschool teacher and soccer coach. After graduating from Rutgers U in 2012 studying community nutrition, she WOOFed in Costa Rica, volunteering at an organic permaculture farm. In doing this, she learned a lot about plants and decided she wanted to learn much more! It's been a great adventure. In her spare time Kat is the 4-H leader of the children's cooking club of Mercer County- The Junior Master Chefs! Kat Enjoys hiking, cooking, obsessing over rocks and minerals, and making new friends - human or animal. Kat feels very lucky to meet everyone that comes her way at market, CSA, galore! Phoenyx has been with Roots since August of 2016. Whether it be harvesting, doing tractor work, tending the till at market, or discussing soil ecology, Phoenyx is fascinated by all aspects of farming and its transformative effects on the land and its peoples. After having volunteered on several local farms and two years spent as produce manager of a natural foods market, Phoenyx decided that they wanted to get to the source of sustainable food production and be a part of the local organic agriculture movement. Phoenyx views food as something which addresses a myriad of topics, but believes that its ability to establish communal connectivity and a sense of place are some of its most rewarding aspects. When not on the farm, Phoenyx likes spending time in forests, going to punk shows, making music, and nerding out over plants, crystals, and delicious vegan food. Steph is a first year farming apprentice who just got back from serving as a Peace Corps Volunteer in Malawi. She is originally from Bucks County, PA and is grateful to commune with her home soil after 4+ years of traveling! Steph got her start in farming on the Big Island of Hawaii after college. While working at a tropical fruit and livestock farm, she fell in love with the holistic and satiating lifestyle farming provides. After Hawaii, Steph began her Peace Corps service where she taught sustainable agriculture, nutrition, and environmental education to her village in Malawi. Steph is excited to keep learning and growing with the Roots community! In her free time she loves reading, writing poetry, playing records, dancing, and baking for friends! Julie is starting her first year at Roots to River and is so excited to be a part of this warm, vibrant farm family! Julie graduated from Penn State in 2015 with a degree in agroecology. She completed a year of AmeriCorps service in Vermont working as a gleaning coordinator at a nonprofit. Connecting people to local, nourishing produce was incredibly rewarding work; and she then decided to fully immerse herself in the farming world. Last year she spent a full season at Broadfork Farm – a small diversified veggie farm outside of Richmond, Virgina. She loved it and is back for more! Julie’s heart lies in the honest, hard work of farming and being a steward of the land. When not on the farm you can find Julie doing yoga, going for runs along the river, cooking all the veggies and hanging out on her trailer deck. Oh, and Julie’s spirit vegetable is a beet but she feels pretty passionately about all vegetables. This is Breezy's second year on the farm. She joined the R2R crew after exploring and farming in the Hudson Valley region of New York State. She discovered her passion for farming after returning from a year working with an NGO in Bangladesh. Needing space to rejuvenate and longing to do work that was tangible and meaningful, she began volunteering on farms. It wasn’t long after sinking her hands in the soil or sinking her teeth into a freshly picked apple that she realized her life was forever changed. Born and raised in NJ, she is excited to be working her home soils for the first time with the farm’s expansion into the Titusville, NJ, property. With the dream of starting a farm of her own, she is so happy to be learning and growing with Malaika, the Roots crew, and the local farming community! When not farming, Breezy enjoys hiking, evening runs, learning new crafts, and cooking up tasty dishes to share with friends. Jade Greene has been a Roots to River CSA member since their first year and is thrilled to be a behind the scenes part of the farm, which allows her to utilize her unnatural passion for excel. Jade has an Environmental Science B.S. from Penn State and loves all things science. She also loves to read, forage wild plants, crochet, cook vegetarian delights, and take forested adventures. Jade gets her R2R work done while Kaia, her infant daughter, naps. Amanda's love of herbalism began when she discovered that nettles could relieve her allergies. She has been drinking nettle tea and studying herbalism ever since. She enjoys coaxing the plants from the earth and coaxing the healing properties from the plants. She considers the plants to be her greatest teachers and is looking forward to a lifetime of learning from them. Amanda moved to New Hope in 2013 to lend her energies to the creation of Roots to River Farm During her two years there, she fell in love with the vibrant culture and community of Bucks County. She decided to stay and provide herbal medicine to the community she had grown to love. She started Locust Light Farm 2 years ago and now creates incredible herbal products and provides educational opportunities for the community to learn about herbal medicine and farming. When she's not farming, Amanda enjoys reading and writing poetry, cooking for friends and family, and sipping coffee in diners. Ian and Shelley are the chefs and teachers at The Farm Cooking School which resides on the farm at our Titusville location. The Farm Cooking School is a space where cooks of all levels can come together to learn about and enjoy great food and real community. Ian and Shelley and their crew of amazing chefs and assistants offer cooking classes and dinners on the farm. They take advantage of farm produce to make delicious pantry items and prepared foods available for customers at the Roots to River On-Farm Market. Sniffer, hunter, cuddler, loud greeter, roller in stinky things, carrot stealer and all around goof ball.